The U.S. Small Business Administration (SBA) has designated the first week of May as Small Business Week. Every year since 1963 SBA takes the opportunity to highlight the impact of outstanding entrepreneurs, small business owners, and others from across the nation through National Small Business Week. Baker Creative has operated as a small woman-owned business in Groveport, Ohio for more than 20 years. Owner and creative director Michele Cuthbert said that small businesses have an advantage over the larger agencies. “We are flexible and able to make decisions without having to go through an extensive chain of command. Our clients have the comfort of knowing their campaigns are managed at the highest level, and they appreciate having access to the owner,” she added. “We are able to compete with the big agencies in our pricing and expenses because we work leanly and do not have the overhead that a Manhattan firm has,” Cuthbert said. With many of the big box retailers closing their stores in shopping centers around the country, small businesses have an even greater opportunity to position themselves by personalizing their services. Utilizing social media enables small businesses to reach a vast consumer market at minimum expense. However, maximizing social media requires frequent, if not daily, fresh content for the greatest return. Since its founding on July 30, 1953, the SBA has delivered millions of loans, loan guarantees, contracts, counseling sessions and other forms of assistance to small businesses. They provide access to business financing, education and technology training for entrepreneurs, government contracts, and other services to help small businesses, start, manage and grow. 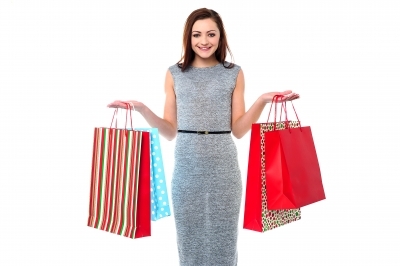 “There are many tools to help small businesses thrive and reach broad consumer audiences. We are happy to collaborate with other small businesses to develop branding and web-based strategies for success,” Cuthbert said. “It really is another example of how interdependent we are and how we can mutually assist one another in adapting to changing consumer practices,” she said. There is so much daily pressure to get it all done. Our schedules fill up before we know it. Sometimes it’s due to our clients work, while other times we simply try to do too much. Staying “busy” isn’t always the most efficient way to work. Some people feel harassed by the constant interruptions of emails, phone calls, texts and maybe an unexpected meeting or two. 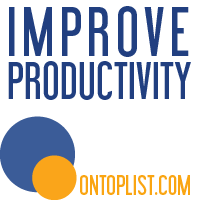 We want to avoid mindless “productivity,” which is the constant need to do something, amounting in a tendency to waste time on menial tasks. Your business can become “blocked” if you are avoiding things like cold calling, proposal rejections or even dealing with a challenging client. It is much better to have a proactive plan rather than a reactive one to tackle the tough parts of the day. A positive energy flow promotes creative thinking and helps you cope with issues easier throughout the day. #1 Simplify.Your day shouldn’t be about squeezing as many tasks into it as possible. It’s about simplifying how you work, doing things quicker and relieving stress, thus allowing space in your life for people, rest and play. #2 Learn to say no. Remember, you are in charge of your schedule and agree to set the items on it. For instance, if your child wants to play the piano but also wants to play basketball, you can always negotiate. You are an example to them on how to manage your busy life. It also sets boundaries for them so you can rebalance your life in a more purposeful, healthy manner. #3 Set aside one hour a day to plan. Strategize how to address any issues and do the hardest task first to keep your energy level up. #4 Don’t multi-task everything. 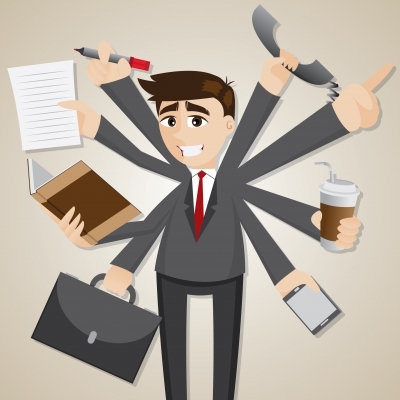 Did you know only 2% of people can multi-task efficiently, according to studies? No need to add all the extra pressure to always be “on.” You might be getting many things done, but what is the quality of work? #5 Your “to-do” list should be realistic. Do not allow yourself to get overwhelmed by it in totality. One of the fastest ways to get stressed out is to think about your massive to-do list. Focus on the one task before you. Then tackle one, single, solitary task at a time. Helping clients is our #1 priority. Get a sneak peak to what Baker Creative has been up to. Top 5 indicators my company needs public relations? Public relations can be an invaluable tool to amp up your word of mouth. It can range from educating your target audiences to repositioning your company against the competition. Many times we all have enjoyed the community events and charitable happenings fueled by PR. It also can fast track a company into the main stream spotlight. 1. My company is going through a merger. 2. My company wants to launch a new service/product. 3. No one knows what my company is doing. 4. Your company and staff are doing lots of outreach but no one outside of the business knows about it. 5. You want to reposition your company in a specific focus and different light. Public relations can be quite cost effective when compared to the small investment in working with the media vs having to pay for that media placement. The right campaign can provide exposure to a much larger audience for a modest investment. Recently we did a short media blitz for one our customers. He did a local media appearance which resulted in his message being delivered to 250,000 folks and a consistent spike in product revenue. His investment was a small fraction of what the actual media buy would have been to buy the air time to deliver his message to the right audiences. Not to mention the print media coverage to add an additional 40,000 readers. A reputable firm will offer a client metrics to leverage big data to show how the approach moved audiences into an action or reaction. If you are looking for some professional help please give Baker Creative a call to find out more at 614.836.3845 for an assessment. Is going to work making you sick? Repetitive stress injuries (RSIs) are conditions caused by placing too much stress on a joint, such as unusual repetitive movements. Most RSIs are linked to the stress of repetitive motions at the computer or overuse injuries in sports, sometimes referred to as repetitive strain injury (RSI) or cumulative trauma disorder. RSIs frequently develop at work. Small, repetitive activities can strain the muscles and tendons of your upper body, including the shoulder. Activities that can cause RSI include: use of industrial machinery, use of a computer mouse, swiping items at a supermarket checkout stand and carrying or lifting heavy loads. Chronic shoulder pain often stems from prolonged, repetitive, or awkward movements. This type of pain is sometimes referred to as repetitive strain injury (RSI) or cumulative trauma disorder. RSIs frequently develop at work. Small, repetitive activities can strain the muscles and tendons of your upper body, including the shoulder. Chronic shoulder and neck pain can a result Working long hours at a computer can really take a toll on our bodies. According to the U.S. Bureau of Labor Statistics, nearly two-thirds of all occupational illnesses reported, were caused by exposure to repeated trauma to workers upper body ( the wrist, elbow or shoulder ). One common example of such an injury is carpal tunnel syndrome. Often times determining contributing factors can be difficult. Being sedentary such as working at your computer can weaken your muscles, resulting in pain. 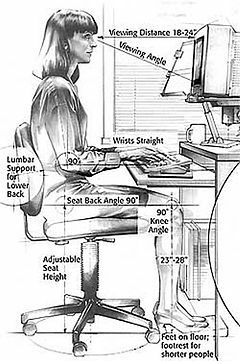 Often times, as the day goes longer, many tend to get more tired sitting at their computer, resulting in poor posture and pain. – try taking frequent breaks to stretch and get moving. It will also clear out your mind for a short mental break. Set a calendar reminder on your computer to remind yourself to take frequent breaks. Giving your eyes a break will help you distress at work. Try refocusing them on a object about 20 feet way periodically throughout the day. – your computer monitor should be about a shoulder’s length away from you with the top of the monitor at eye level. – keep the keyboard and monitor directly straight in front of you to avoid long term turning of your neck/head. – your elbows should be even with your work space. Consider installing an adjustable keyboard and mouse work tray to your desk. – to give your dominant hand a break, try switching to your other hand to run the mouse on your computer. It will force you to low down a bit which may provide some relief. – get a phone headset for longer calls to avoid cradling the phone between your neck and shoulder. You can also use you non-dominant hand for phone calls to free up your hands for computer use. – write a note or set a reminder on you calendar to sit correctly. These are a few tips to address pain and discomfort. We recommend seeing your doctor for a examination to determine the root cause and for treatment before trying these tips. What do PR professionals do anyway? Many think public relations has become “a spin doctor” in folks’ minds. PR professionals don’t write ads, write stories for reporters or write commercials. PR firms promote companies or individuals through traditional editorial or online digital channels. “Earned” or “free” media are stories in newspapers, magazines, TV show or websites. This is different than a paid ad that was bought and placed on a specific publication or media channel. PR agencies goals are: promoting clients and positioning them as successful, honest, important or exciting. Articles or TV appearances in respected publications have the advantage of third-party validation. These media pieces are generally viewed by the public more favorably. Researching, conducting and evaluating, on a continuing basis, programs of action and communication to achieve the informed public understanding necessary to the success of an organization’s aims. These may include marketing; financial; fund raising; employee, community or government relations and other programs. The best PR efforts are the ones that really speak to audiences that resonate and align a strong, memorable message. In the long run, public relations can be a smart investment in your brand. The visibility of a firm or individual can be measured in increased recognition and reputation. We can relate to running from one commitment to another all day long, which has you feeling empty and on edge. More and more folks are finding themselves staying up all hours of the night unable to sleep. Tons of thoughts run through their mind resulting in massive to-do lists for the following day. Take some time and slow down to breathe. Overloading may give one a sense of accomplishment, but at what cost? Here are a few tips to help you destress and hit the pause button just for a brief moment. Did you know: meditation boosts many hormones that affect your overall well-being. It increases your DHEA which alleviates depression, your GABA which stabilizes your mood and your melatonin which helps you sleep better. Take a few minutes daily to sit quietly to focus on your breathing. Breathe deeply in and imagine stress breathing out of your body You’ll feel refreshed immediately. Why not incorporate a little yoga or meditation into your early morning routine? Most stress comes from either reliving the past or worrying about the future. Some may even fret over what-ifs. Typically, the what-ifs don’t come true and add a ton of wear and tear on you mentally. It is hard to feel energized when all of your focus is on worry. The more you worry the more anxiety builds up. Don’t allow yourself to get flooded with negative thoughts of anxiety. Tip 3: If you can’t change your situation, change your perception. Does your life feel like it’s beyond your control? Feeling sorry for yourself is not the answer. The reality is few things are beyond your control. You almost always have the option to do something that shifts your circumstances. If you have negative thoughts creep in, replace them with a positive ones. Refuse to allow that negative thought to rent any more space in your spirit.